Hope you had a successful time in Africa 2008. I mailed your firearms paperwork today. Bring all of it with you. We will go to customs in Darwin when you arrive and get your export permit. We just returned from 6 weeks in camp and will be home until June 10th and I need the loading data for a 9,3x62 with your 9,3 mm KJG bullets before then I have comparative burning rates for Hodgdon (preferred as most of their powders are acutally made in Australia) Vectan, Norma, Accurate Arms, Alliant, Dupont and Winchester powders so you will need to give me data for at least one of these. I see at "Neuigkeiten", you are already working again. Lutz on behalf of me and Leana we want to thank you for the time you spend with us in Africa 2008. Like always it is nice to have some-one as prepared and equipped as you. We are very happy for the successful Buffalo hunt which we had with you. Your 9,3 mm KJG bullets for the 9.3 x 64 performed tremendously on all the African animals. The bullets performed faultlessly hunt after hunt. For the buffalo with a short escape distant up to all the other animals which you hunted successfully. I wish you the best and also looking forward on seeing you and friends in November 2008 in Finland. I am already starting with some preparation for the Elefant hunt which we will conduct in the near future. Africa 2008 went well. I shall publish the Pictures and Stories shortly. I added some of the available Powders to 9,3x62. I would prefer to load the 9,3x62 Backup rifle with the 9,3 mm KJG at 83,5 mm overall Length including the Tip ). The Tip is 9 mm long. 4 g Alliant Reloder-10x , or as much as You can stuff ina and the Bullet will still hold, is a good Load. Hogdon would need 3,82 g H4198 or as much as You can stuff in and the Bullet still holds. Compressed loads are wellvcome. You cannot overload these Powders with the 9,3 mm KJG in the 9,3x62. Other Data re available her on 9,3x62. Today I was offered to shoot two Wild Cows for free. Ten escaped. Eight caught the Veterinary with a Injection dart. But these two ones are two wild. The Owners has given up on them. Hunters in the Area hesitate to shoot Cows, as they find that not so appealing. I love it for Bullet testing. The 9,3x64 is ready and I wait for a Call. At which Time (Your Time) is it best to call You? 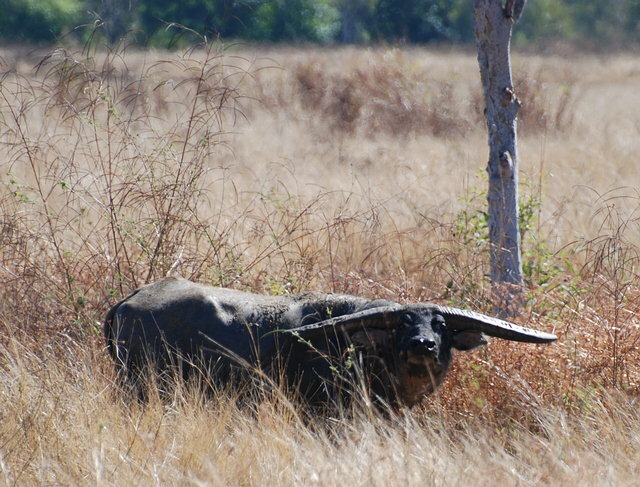 Have a good hunt and return safley.Those Australian water Buffalo are BIG and mean ! Regards Walter.